Les Peupliers Hotel in Courchevel is perfectly located in the heart of the village of Le Praz by the lake and near the ski lifts. Enjoy the comfort and luxury of the Hotel, the Restaurant serving authentic cuisine, the Spa, and the family-friendly atmosphere. The Hotel Bar and Restaurant, first opened in 1938 by the grandfather of the current owner, Norbert Gacon, is a 4-star hotel for relaxation and well-being. Norbert, his wife Nadine, and the team of Les Peupliers, do everything they can to make your stay in Courchevel an unforgettable one. Need to organise a transfer, an excursion, book a guide or skiing lessons? We are there to help you. The Hotel has 19 comfortable and elegant rooms, offering accommodation for 1 to 5 people, most with a large balcony. 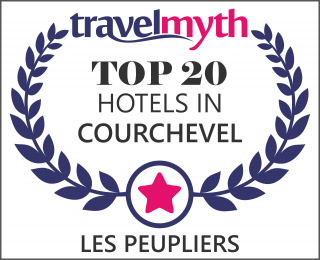 Enjoy the comfort of a 4-star hotel in the heart of the village of Courchevel Le Praz. Treat yourself to a good breakfast to make sure you’re in shape for the day’s activities. The hotel serves a range of hot drinks, fruit juices, several varieties of bread, cereal, pastries, fruit and nuts, not to mention our homemade jams. We also offer a range of savoury items such as ham, cheese and omelettes.